Two more firsts today: first whisky to crack the 20 Year plateau (at 20 years exactly) and first repeat distillery (Speyside’s BenRiach). 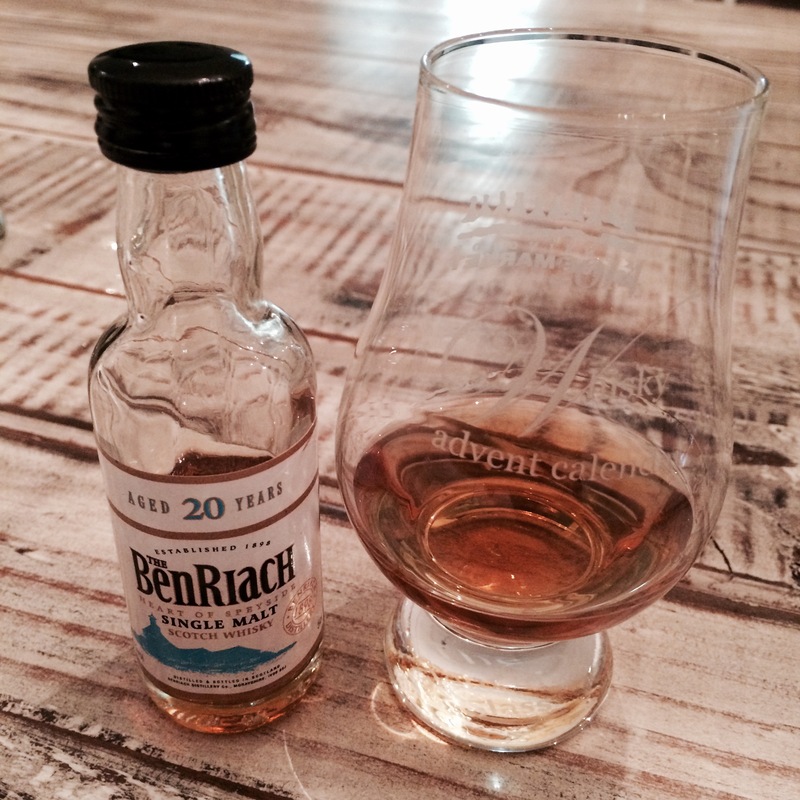 Behind door #11 on my Advent Calendar was BenRiach’s 20 Year Single Malt scotch, which looked stylistically identical from the outside to the BenRiach 16 I had back on Day 2. But the extra 4 years of aging had a monumental impact on the elder whisky’s colour, which was one of the darkest to date, a phenomenal deep amber. Clear your mind. Have a scotch. This scotch. Maybe it’s due to my fatigue level, or to my body’s overreaction to the desperate stress relief of a stiff drink after hauling two small children around a packed Zoolights tonight, but I went instantly visual upon smelling this scotch, mentally transported to vast golden wheat fields under a spotless blue sky, a realm of endless space. I am keenly aware that that particular vista doesn’t scream “Scotland”, but this whisky has a mellowness and calmness to it that makes me think of the prairies. And it doesn’t taste half bad either: lots of spice to lend some zest to the more languid flavours of beeswax, golden apple, vanilla, wood and char. There’s a quiet power in it that you can sense in the long, honeyed, slightly malty finish. All in all, a great little dram with the stuff to back up its $110ish price tag. Halfway point tomorrow!